Identifying, understanding and managing risks are at the core of the insurance industry. All risks have various dimensions, but the environmental, social and governance (ESG) profile of a risk is a dimension that has only recently found its way into risk analysis in the industrial insurance segment. Compared with other types of perils, such as financial risks, the understanding of the relevance of ESG issues and their practical application for insurance is still in its infancy. 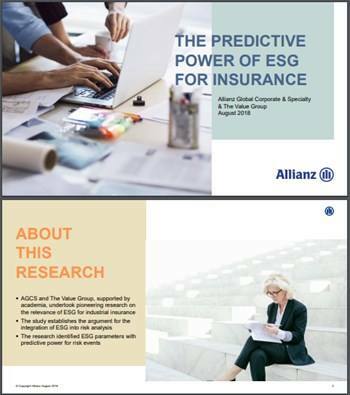 To bridge this gap, Allianz Global Corporate & Specialty (AGCS), together with The Value Group, a Munich-based research and investment consultancy, initiated a research project to assess the relevance of ESG for industrial insurance. The project is supported by Prof. Dr. Klaus Röder, Chair of Financial Services from the University of Regensburg and Prof. Dr. Rudi Zagst, Chair of Financial Mathematics from the Technical University of Munich.